Potato chips are so tasty that we eat them despite their drawbacks. Want to chow down without guilt? Enjoy a few from our list of the 8 healthiest chips to eat (or, perhaps we should say, "least unhealthy" chips to eat). Overall, they're part of a food group to avoid. But if we must... there are some chips with healthier (and fewer) ingredients than others. We all know chips are bad for us. Yes, they taste insanely delicious. Yes, their crunch is increasingly satisfying. They’re easy to grab and they go down the hatch so quickly. Now for the downside: Potato chips are filled with fat (some of which is trans fat), calories, sugar, and sometimes acrylamide. Here’s the rub: We’re going to eat them anyway. Next time you’re grabbing a bag from the junk food aisle, choose one from our list of the 8 healthiest chips to eat. WHAT’S THE WORST CHIP TO EAT? Steer clear of any chip that contains a multitude of ingredients, refined flours (e.g., refined potato, or bleached flour), an excess of sodium, and added sugars. These superstars contain only three ingredients: non-GMO potatoes, organic coconut oil, and sea salt. Added bonus: They’re high on taste. These zesty chips are made with non-GMO ingredients, contain no preservatives, and contain a mix of sweet potatoes, cassava, and taro. 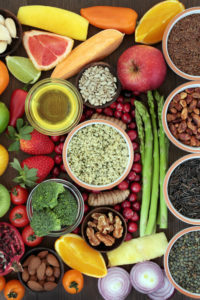 They boast twice the fiber and 30 percent of the fat of regular chips as well as almost 30 percent of your daily requirement of vitamin A and 2 to 3 percent of your recommended intake of vitamin C, iron, and calcium. Note: These also contain an anticaking agent called silicon dioxide. Try them naked (i.e., without salt) for the healthiest version. 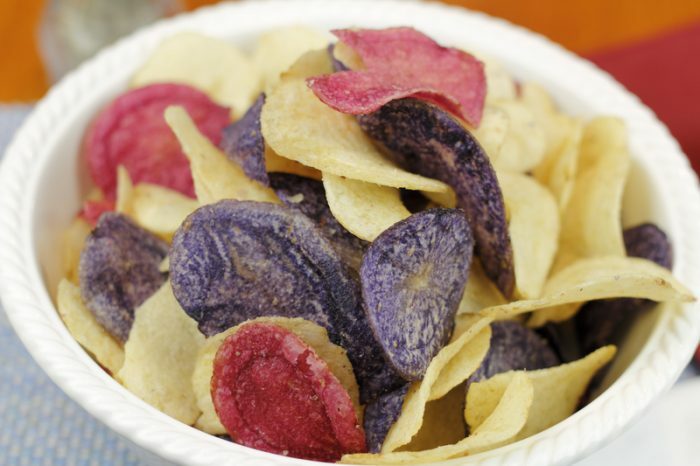 Like the Trader Joe’s variety, this chip’s only ingredient is beets. One 28g bag will set you back a mere 100 calories while offering a whopping 5g of fiber and 0g of fat. The 19g of sugars is a bit high, but it’s all natural. These raw chips are air dried (not baked or fried like other chips). They’re made from a base of veggies like carrots, yams, or beets with ingredients like flax seed, buckwheat groats, apple, olive oil, nutmeg, allspice, and cinnamon to spice things up. They’re non-GMO, gluten-free, and vegan, with only 90 calories, 3 g of fat, 3 g of sugar, and 3 g of fiber in a 28 g serving of the sweet potato flavor. Brad’s Veggie Chips also offer 10 percent of your required intake of vitamin A and 6 percent of iron. With a multitude of flavor and no skimping on spice, these healthy tortilla chips are a good whole-grain alternative to Tostitos. The Blue variety are also low in sodium (10g), which is helpful for those watching their blood pressure. Yes, we know. This is a cracker, not a chip. Trust us, though—it’s worth the crunch. Made with organic whole grain brown rice and quinoa as well as a boatload of seeds (pumpkin, sunflower, sesame, flax, and poppy) they’ll have you crunching on goodness with every bite. They’re so tasty, in fact, we bet you’ll forget you ever wanted a classic potato chip in the first place. ARE CHIPS HEALTHIER THAN FRIES? So, are chips healthier than fries? That depends, says Lauren Minchen, a New York-based registered dietitian. If the potatoes are fried in coconut oil, they’re generally healthier than those fried in vegetable oils. It’s not news that vegetable oils turn into trans fats at high temperatures. Coconut oil is high in saturated fat, however, which can raise LDL cholesterol (a.k.a. “bad” cholesterol) as much as beef fat, butter, and palm oil can. “Baking either of these can be a better option and help reduce oil and calories in both the fries and chips. Baked chips are less oily (typically) than standard fries, but baked fries may be less oily than standard chips,” she says. acrylamide, bad cholesterol, beets, blood pressure, calcium, calories, carrots, cholesterol, coconut oil, coriander, diet, diet plans, fiber, food, food cravings, gluten, gluten free, gluten free and, health, healthy diet, healthy eating, healthy eating plan, iron, is it bad to eat at night, is pizza healthy, ldl, ldl cholesterol, nutrition, organic, potassium, potatoes, preservatives, protein, quinoa, sugar, trans fat, vitamin, vitamin a, vitamin c, whole grain.